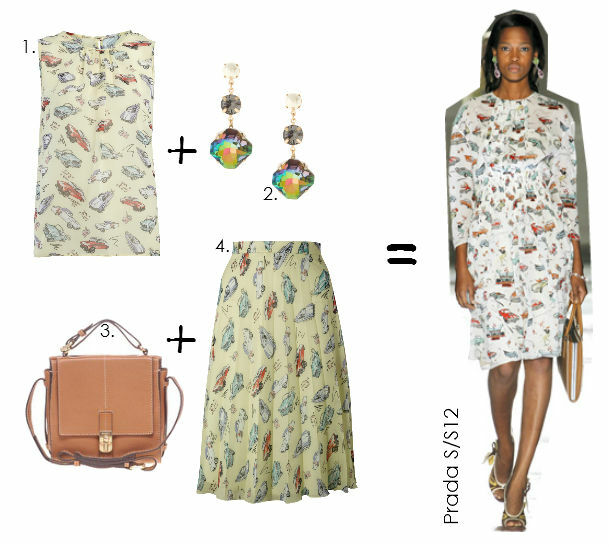 If you were a fan of Prada's 1950s-inspired SS12 catwalk show, then you will no doubt be pleased to see that Primark have revved up their spring/summer collection with car-print pieces that are more than just a little 'Prada-inspired'. For the authentic Prada look, wear the print head-to-toe, accessorize with colourful jewel earrings and prepare to accelerate to the top of the fashion charts! 1. Car print shell top, Primark. 2. Drop earrings, ASOS, £10.00. 3. Ameko tan leather bag, ASOS, £85.00. 4. Car print pleated skirt, Primark. This looks like such a great collection! I wish I had a primark closer to me. Also, i'm running a giveaway on my blog at the moment for either an American Apparel clutch bag or Models Own nail varnishes so please check it out! I only we had Primark in Italy!!! Well spotted! And I love those earrings!!! ps will keep my eyes open for a high street version of the bag for you! I like so much the outfit you create! If you wan we can follow also with bloglovin, google+ and facebook? beautiful print...so great you found it!!! Wow! that shirt is from Primark!!! I want it now!!!!!! I love that trend! It must be great with a pair of jeans! at first it looks like a pajama (because of the print), but then if you see the whole of it, it surprisingly looks trendy!